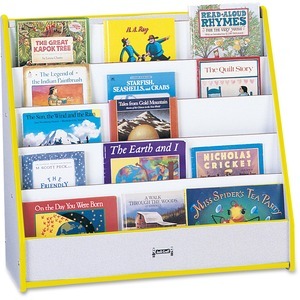 Flush-back book stand easily stores a variety of books. Each of the five display shelves are approximately 1"" deep to conveniently display books in a visible way. Laminate is durable and features an easy-to-clean surface. KYDZSafe rounded edges allow children to play safely without getting hurt by sharp edges or corners. TRUEdge is permanently thermo-fused to the edges to prevent chipping. Dowel-pin construction prevents weakening at the joints.